This is the second and final installment of vintage demonstrators from a remarkable collection, decades in the making. There are still more modern demonstrators from the same collection yet to be listed, however, so keep checking back over the coming weeks. A full listing of all our demonstrators for sale can be found here. 13929: Parker Vacuum Filler: "Crystal", lacking cap, nib and blind cap, but with outstanding transparency, crisp unworn imprints. Strictly speaking not a demonstrator, as it lacks a "DEMONSTRATOR" imprint. Original hardened diaphragm has not been replaced. 13883: Parker 51 demonstrator: transparent Vac-filler, frosty two-tone Lustraloy cap, gold filled Blue Diamond clip, good barrel imprint with 3rd quarter date code; condition sound, noting scratches to interior from overaggressive cleaning of old diaphragm residue, fine stress marks on shell skirt (see details). 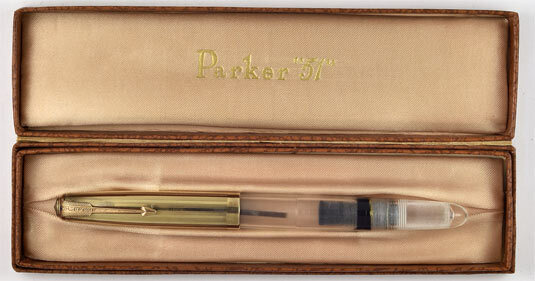 13855: Parker 51 demonstrator: transparent Vac-filler, USA production with good barrel imprint with 3rd quarter date code, 1/10 16K gold filled cap in grouped parallel lines pattern, clip however is distinctively Canadian with high Blue Diamond, box is also not USA; one stress line in blind cap (see detail). 13875: Parker 51 demonstrator: transparent Vac-filler with Lustraloy cap, gold filled Blue Diamond clip, barrel imprint has been largely polished away but 4th quarter date code clearly visible; one stress mark over diaphragm seat, does not affect function (see detail), blue ink residue inside pen has not been fully removed, cap jewel a bit rough. 13872: Parker 51 demonstrator: very clean transparent Vac-filler, strong barrel imprint with 4th quarter date code, two-tone clutch ring, sterling silver cap, gold filled Blue Diamond clip; pristine barrel with perfectly preserved factory internal machining, a few tiny stress marks around the skirt of the shell (do not affect function). 13859: Parker 45 demonstrator: transparent barrel and shell, brushed stainless cap, chrome plated trim, made in USA, 14K gold nib unit, includes early fat metal squeeze converter. An uncommon demonstrator, especially hard to find in pristine condition. 13876: Parker/Kullock 51 demonstrator: custom modern demonstrator, made by Ariel Kullock using a newly-made transparent hood and barrel and vintage Parker 51 parts including 1/10 14K gold filled cap in fine parallel lines pattern; 14 cm long, Aerometric filler, gold filled clip, aluminum clip jewel. 13962: Sheaffer PFM III demonstrator: rare transparent dealer-only version of Sheaffer's oversize Snorkel-filler; 13.65 cm long, gold filled trim, White Dot, all seals have been replaced, in perfect working order; black nib-hood assembly is correct, as clean as an example as we have ever handled, one barely visible stress mark on back of cap (see detail). 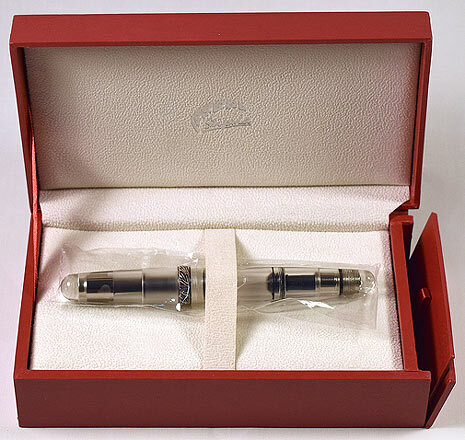 13961: Waterman lever-filler in box: transparent acrylic dealer-only version, 13.3 cm long, gold filled trim. 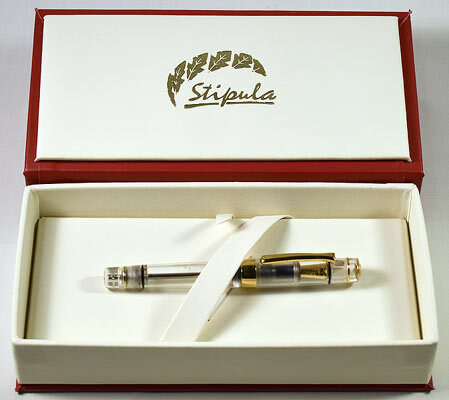 13930: Stipula Suprema Nuda in box: limited edition of 351, oversize transparent plunger-filler, 13.6 cm long, gold plated solid sterling silver trim, 14K nib (white gold or white plated), in box with all paperwork, outer sleeve; two available. 13902: Stipula Etruria Nuda in box: limited edition of 50 for Swisher Pens, oversize transparent piston-filler, 14.3 cm long, gold plated sterling silver trim, two-tone 18K gold nib, includes all original packaging.